Spanner in the Workz: Choctacular! 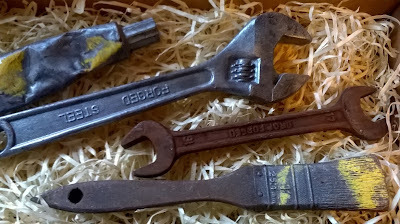 One of the tool-related unforeseen gifts from an a fab friend this Christmas 2015; chocolate tools by the Amazing Chocolate Workshop. From looking alone it is hard to believe they aren't real! I've had the pleasure of devouring many chocolate tools from generous/perceptive friends and family over the years but these are in a league of their own. I know little in the art of chocolatiering but I'd say these fall into the category of being art in their own right! A worthy, delicious, albeit brief post to mark the end of one year and the beginning of the next. Happy New Year to all and stay tuned to A Spanner in the WorkZ for upcoming posts on my experiments in Silverpoint and the Drawing a Week Project 2015 review! 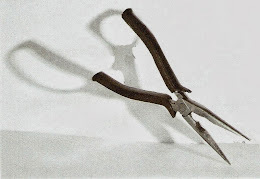 ...and words in a sentence seldom used, "I'm off to eat these tools!"